* The advertised Lease is a rental-purchase agreement for new merchandise. Unless you exercise your Early Purchase Option, to acquire the merchandise you must make 52 weekly payments of $10.00 (plus tax & delivery), for a $520.00 (plus tax & delivery) Total Cost/Total of Payments. This includes a $251.49 Cash Price3 and a $268.51 Cost of Rental. 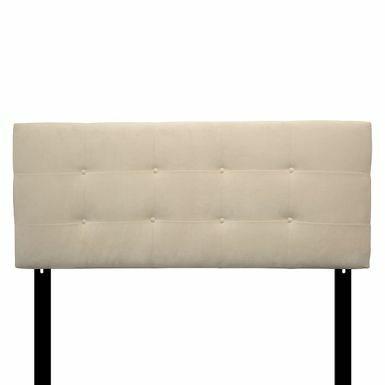 Update the look of any bedroom with this cream button-tufted headboard. The light upholstery adds an airy appeal to the space, and the height of the headboard is adjustable so it can work with any mattress set. Dark legs complement the upholstery. Enhance your bedroom decor with this stylish headboard which features detailed tufted stitching. This versatile headboard is height adjustable and is upholstered in beautiful fabric. Turn your favorite basic bed frame into a complete sleeping center by adding this attractive headboard. The thick layer of foam padding under the neutral pearl-colored upholstery fabric is fire retardant for a little extra safety in the bedroom. A sturdy wood frame is hidden below for stability and strength.